An eagle comes in to greet you! Be careful with that fire cracker! 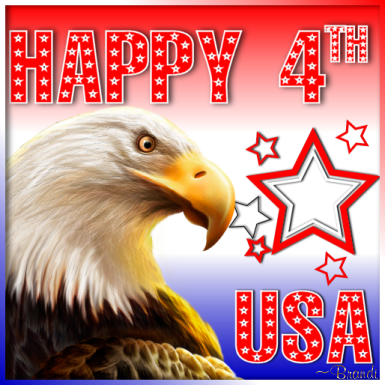 I have just finished posting the Patriotic avatars for 2010. If yours is not here, and you want me to make you one, let me know! As always, if you request any changes, let me know. I hope everyone has a safe and happy summer and enjoys the holidays! Thank-you,Brandi. I loved the red, white and blue fish, very cool. The Patriotic Popeye is great: I favored the fireworks composition, with the contrast of the dramatic black sky, passionate. I will miss A.H. for little while:) Thank-you for remembering Popeye The Sailor Man, his creator E.C. Segar would love it. Mr. Segar would be 115 years old! Brandi,OMG!I am gorgeous. Digger is too! Thank you so much. Wonderful Brandi, I so appreciate your hard work. I'm going to change the avatar right now Zoe was a beautiful dog, thank-you. Brandi...what a treat!! I appreciate so much that avatars you've made for me to use. I love them all. I, of course, had to scroll through and look at everyone's new avatars and, as always, am amazed by your imagination. THANK YOU!! Brandi-HELP! I trust you and your imagination! Go Girl! Thank you so much Brandi! You are soooo good! Wish I had your talent! Have a great Memorial Weekend! I am glad to see you posting with us again! Thank you so much Brandi!! I love the birdhouse!! And I love that you thought of me too!! Oh Gizzie! How could I ever forget about you and your bird? I believe you are the first monkey who had a bird as an avatar. I enjoy working on your decorations! You are very welcome. I thought I had made more for you; I'll check my files and see if I have any unfinished ones waiting on my attention. You are very welcome. Just leave me a post if you ever have something you'd like me to do! I am glad I made the Popeye one, and that you are enjoying it! Have a great summer, seahorse! You are always gorgeous, Trimm! Glad you like your selections. I think you especially like your patriotic wings. You are very welcome. I have always loved working with Zoe's images! I am just happy you like them. Page created in 10.207 seconds with 19 queries.